"I was living with my father when police came to my house and handed me over to the orphanage," says Dhanushka Dilhan. Dhanushka, now 14, lost his mother in the devastating Asian tsunami in 2004. His father, a fisherman in Kalutara in southern Sri Lanka, was too busy working to look after his three sons following the disaster. The tsunami killed more than 35,000 people in Sri Lanka alone. About 200,000 others died around the Indian Ocean. Thousands of children lost parents - and orphanages such as Happy Digits Children's Village where Dhanushka lives were set up to help cope with the tragedy. Six years on, however, many of the "tsunami children" have left the homes and donations have dwindled. Happy Digits is facing an uncertain future. Dhanushka is among an estimated 5,275 Sri Lankan children who lost either or both parents in the 26 December 2004 disaster. "I was doing my routine work. I had neither friends nor relatives and was waiting for my father to return from the sea to have my meals," says Dhanushka. After the authorities decided their father could not care for his children, Happy Digits in Wadduwa, about 35km (22 miles) south of Colombo, became their adopted home. Dhanushka's two elder brothers left the orphanage when they reached 18 and work in nearby tea shops. They visit their younger sibling regularly but contact with the father has been lost. The home currently has 12 children staying, although it has accommodation for 40. After the tsunami as many as 38 children were taken in, but now Dhanushka is the only child there because of the disaster. Happy Digits - managed by the charity Pina Sri Lanka, with funding from Germany - also offers shelter to other orphaned or abused boys from both the majority Sinhalese and Tamil communities. One 16-year-old said he had been handed over to the centre following abuse at a Buddhist temple. Another boy, a 13-year-old Tamil, was delivered by child probation officials after being arrested while working at a shop in Kalutara district. "My mother works as a housemaid in Colombo and my grandfather also works in a house. I don't know where my father is," the boy said. "I was looked after by my grandmother but I decided to find a job as grandmother could no longer look after me." Happy Digits was set up by a German woman, Jutta Abeygoonewardana, and her Sri Lankan husband. The devastation caused by the tsunami prompted Mrs Abeygoonewardana, who has lived in Sri Lanka for more than 30 years, to act. "Two days after the tsunami I went to a number of refugee camps and I noticed many children were suffering. 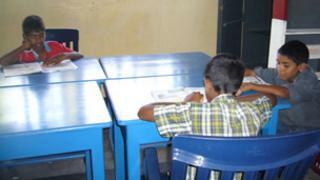 So we decided to build an orphanage," she told the BBC Sinhala service. "We made an appeal through newspaper advertisements in Germany. Many people donated generously for this project." Her husband, Dr Aruna Abeygoonewardana, says the timely help provided by Germans helped them to speed things up. But he regrets the funds have slowed now the tsunami has become a distant memory. "We currently have funds for only three more months as our donors have forgotten about us." Many of the children whose parents died in the tsunami have already grown up and left Sri Lanka's orphanages - official figures are hard to come by but the number is likely to be in the hundreds. The head of the National Child Protection Authority (NCPA), Anoma Dissanayake, said she needed more time to find out details. Other children have been placed with foster families. NCPA officials say more than 350 tsunami orphans have been settled with foster parents through court orders. They say the NCPA offers a one-off payment of 15,000 rupees ($135; £88) to close relatives to look after orphans and monthly financial help thereafter. "We even managed to look after the orphans in the east after the end of the war," the officials said, referring to the conflict with Tamil Tiger rebels which ended in 2009. Where vulnerable children end up is of course of huge concern - some charity workers warn that foreign paedophiles still pose a risk, targeting vulnerable children, including those who survived the tsunami. Sri Lankan child protection authorities say they never allowed specific tsunami orphanages to operate as that would have been against the UN Convention on the Rights of the Child. But they admit it is difficult to monitor the progress of all tsunami orphans. Happy Digits' initial mission may be over. Now it is decision time for Dr Abeygoonewardana and his wife. "I seriously don't know what to do - whether to close this village or hand it over to the government," he says.